Stanley Kubrick's beautifully opulent production takes many liberties with William Makepeace Thackeray's picaresque romance, The Memoirs of Barry Lyndon, Esq (1843), narrated in the first person depicting events from the eighteenth century. 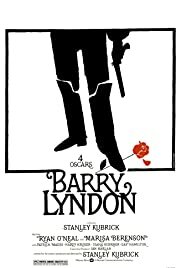 In particular, Redmond Barry who becomes Barry Lyndon, is something of an admirable rake, whereas in Thackeray's novel he is a braggart, a bully and a scoundrel. No matter. Kubrick, in keeping with a long-standing filmland tradition, certainly has license, and Thackeray won't mind. Ryan O'Neal is the unlikely star, and he does a good job, rising from humble Irish origins to the decadence of titled wealth, employing a two-fisted competence in the manly arts, including some soldiering, some thievery at cards and a presumed consummate skill in the bedroom. Marisa Berenson plays Lady Lyndon, whom Barry has managed to seduce; and when her elderly husband dies, she marries Barry thus elevating his social and economic station in life. But Barry is rather clumsy at playing at peerage, and bit by bit manages to squander most of the Lyndon fortune until his stepson, Lord Bullingdon (Leon Vitali) grows old enough to do something about it. This really is a gorgeous movie thanks to the exquisite sets and costumes and especially to John Alcott's dreamy cinematography and a fine score by Leonard Rosenman. The 184 minutes go by almost without notice as we are engrossed in the rise and fall of Barry's fortunes. There is fine acting support from Patrick Magee as the Chevalier de Balibari and Leonard Rossiter as Captain Quinn, and a number of lesser players, who through Kubrick's direction bring to life Europe around the time of the Seven Years War (1754-1763) when decadence and aristocratic privilege were still in full flower. The script features two dueling scenes, the first showing the combatants firing at one another simultaneously at the drop of a white kerchief, the second has Barry and his stepson face each other ten paces apart, but due to the flip of a coin, the stepson fires first. Both scenes are engrossing as we see the loading of the pistols with powder, ball and ramrod, and we are able to note how heavy the pistols are and how difficult it must be to hit a silhouette at even a short distance. It is this kind of careful attention to directional detail that absorbs us in the action and makes veracious the story. Notice too the way the British soldiers march directly en mass toward the French guns. They actually used to fight battles that way! Also note the incredible pile of hair atop Lady Lyndon's head. Surely this is some kind of cinematic record. Bottom line: one of Kubrick's best, certainly his most beautiful film. 110 of 147 people found this review helpful. Was this review helpful to you?